We can get you in the driver’s seat with customized auto loan to fit your budget and credit history. Rates as low as 2.49% APR*. Think you can’t afford the vehicle of your dreams? Ready to trade-in your current vehicle but don’t want a higher payment? 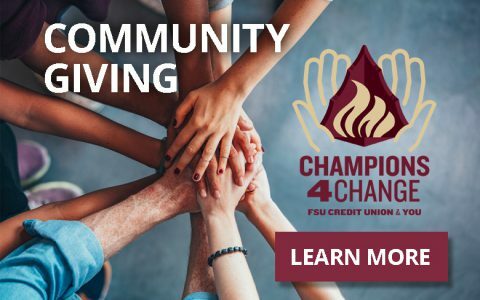 Learn more about FSU Credit Union’s InGear option. With InGear, you can get a payment up to 40% lower, without a lease – you have the benefits of ownership. Learn more here. Troubled credit? New credit? Check out FSU Credit Union’s OnPace program, a loan option for those looking to establish credit or have a negative credit history. Learn more here. Protect yourself and your investment with an extended warranty, loan insurance or the TruStage Auto & Home Insurance Program. Learn more here. We have a selection of credit union-owned inventory available for purchase. Some vehicles may be eligible for an extended warranty program or financing with approved credit through FSU Credit Union. Unless stated otherwise, vehicles are located at the Main Branch. Here are some tips to help navigate the world of negotiation and financing. Read More. What is FSU Credit Union's My Loan My Way? My Loan My Way is a consumer-friendly, auto-loan extension feature that gives FSU Credit Union members an opportunity to reduce their monthly auto-loan payment by extending the term of the auto loan. It keeps qualified members from going through an arduous, time-consuming and costly refinance or modification process. Term extensions may range from 12 months to 24 months, and loans may not be extended beyond 72 months total. For details, send an email to ratereset@fsucu.org or call 850-224-4960 today.